This relates to a recent Daily Post topic, Pride and Joy, and this is one of mine. My grand old cane has frequently become my inanimate companion. I found it in an antique shop, actually years before I even needed it. It felt good in my hand. I loved the intricacies of the carving, and I wondered for whom, by whom, when and where it had been made? Questions I have that just add to its charm. Well, now I need it as a result of a replaced right knee (which is great), and a bum left knee that isn’t. At 75, my balance on uneven terrain, and the challenge of certain steps has prompted me to take it wherever I go. It makes a terrible racket when it falls on a hard surface, I have to look for a place to put it in a restaurant and I’ve left it in numerous grocery carts – but it’s like a boomerang. it always comes back to hold me up and steady my course. Unlike the well advertised miracle cane, mine does not fold up in my bag; I can’t magically flip it out as I exit a booth and it doesn’t have a three pronged flexible base. The one attribute of the Hurry Cane that I covet is its ability to stand alone while I shop. 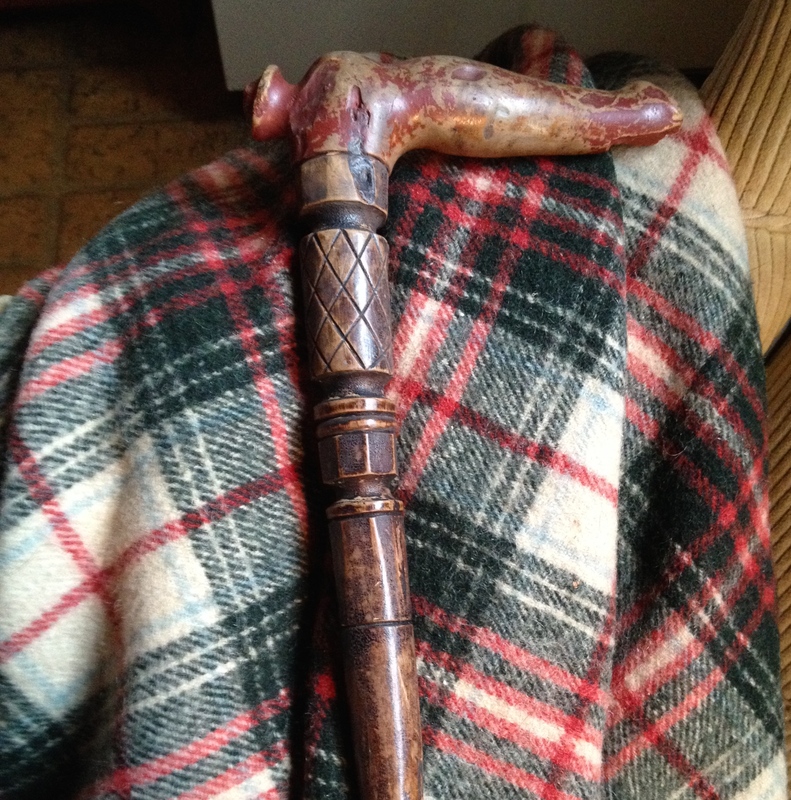 My beautiful old cane has gone to some amazing places with me: great hockey games, the Harvard Museum of Natural History, and my nephew Matt’s graduation from West Point. It’s served me well and receives many compliments on the way – though hurry, it does NOT. But neither do I so it suits me just fine. I, too, have a fondness for old, well-used items that I sense have a story behind them, particularly things that are still useful, like your cane. When I read, I like to sit in an antique barber chair and, while there, frequently wonder about others who sat there, the conversations they had, and whether they liked their haircut. You truly do have a unique favorite thing, and I can almost picture you sitting comfortably in your chair with a good book. Certainly an eclectic piece of furniture. I love it! Goes at its own pace. Stay steady, dear friend! Thanks, Mary! Loved the lake picture on fb with your girls, and know you had a happy day.